Western Australian farm manager, Shaun Earl, recently chose to upgrade to the impressive new Case IH Quadtrac model broadacre machines. 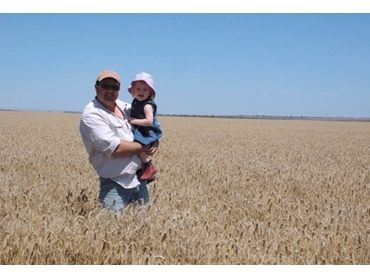 Shaun is responsible for 13,500 hectares of mixed cropping, north east of Geraldton. He recently chose four new model broadacre Case-IH Quadtracs for towing seeding equipment and a 30-tonne chaser bin. The 500 model, 550 model and two 450 model broadacre machines purcahsed will be put much used at harvest following delivery in March next year. Shaun explained that potential fuel savings were among the key features that stood out when searching for new broadacre machines. Multicontroller Drive Logic armrest with intuitive control panel that places key functions at the operator’s fingertips.